The four sizes available ensures you can select the proper dish for your dog's size, thirst, appetite, and weight control program. These specialized feeding and watering dishes provide a natural, hassle-free way to benefit your dog's good health. 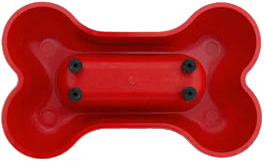 The unique narrow design only allows a dog's jaw to open in the elongated direction of the dish. This naturally places the dog's ears outside the food or water area and keeps them cleaner and dryer. Your dog will eat slower and more comfortably with less mess. Overweight dogs that eat slower may be more satisfied with less food, resulting in weight loss. Overall size: 9" x 5½" x 2¼"
Interior Size: 5½" x 2" x 2"
Interior Size: 7" x 2¾ " x 2"
Overall size: 13" x 7¾" x 3¾"
Interior Size: 7½" x 3" x 3½"
All Dogbone, Inc "Ear-resistible"™ animal feeding dishes are warranted against defects in materials or workmanship for a period of 1 year from date of purchase. Any Dogbone, Inc. product returned within 30 days from date of purchase is eligible for exchange or refund.